It’s December! And after this week of finals I’ve got winter break until January. I’m so excited to have a bit of time to prep for the new year and to be lazy and knit and catch up on reading. But let’s talk about what I was able to accomplish in November, shall we? It was a pretty productive month! Eli’s Gap inspired cardigan. I really love when I’m given a bit of inspiration to make something special. A newborn dress. So much tiny cuteness. My Rosemont Cardigan. I felt like I hadn’t made myself something in so long but it had only been a month. Mind you I’ve still got some WIPs I want to finish. My brioche hat. Fitting all this hair into a hat is definitely a challenge. Another Wee Sherlock. And in my favorite color combo. And a well loved hat. My husband lives in this thing. I honestly can’t believe that 2018 is almost over! What were you able to finish in November? Thank you for the hat idea for my husband. He tends to be particular about his hats. I finished socks and two woven scarves. Your productivity is amazing!!! 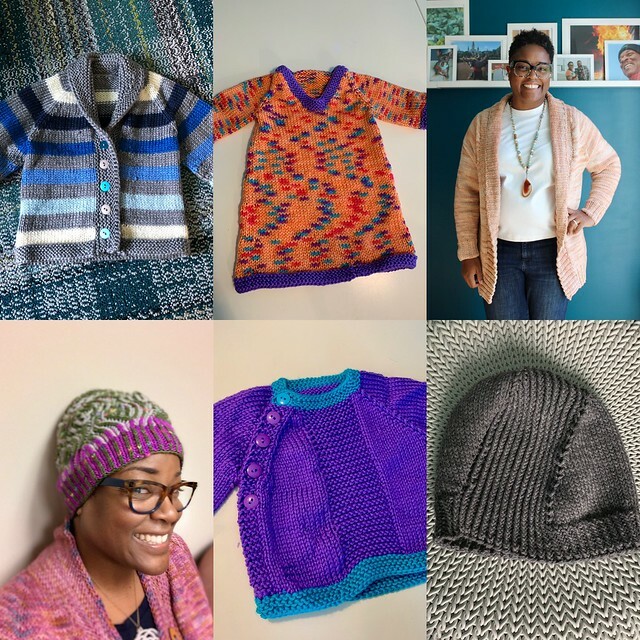 I wish I had knit this much in November— I wouldn’t be doing this mad dash right now!! !